Pininfarina, the Italian styling house best known for its shapely Ferraris and Alfa Romeos, is teaming up with French electronics manufacturer Bolloré on a new all-electric four-seater. A couple of years ago Bolloré showed off a prototype called BlueCar (pictured), built to demonstrate its lithium metal polymer batteries, which will power the new Pininfarina car. BlueCar was styled with the help of Renault, explaining its resemblance to a Kangoo that’s swallowed a beach-ball. 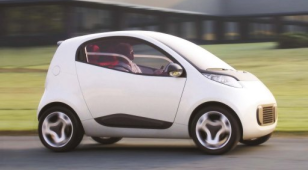 It’s safe to say that the new electric car will share little in the looks department with BlueCar. 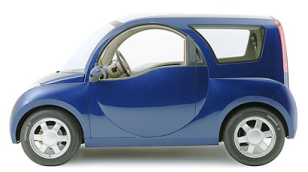 Perhaps it will share something with Pininfarina’s 2004 Nido city car concept (pictured below). According to Bolloré its lithium-metal-polymer battery pack will provide a range of 250km (155 miles) and, remarkably, will be good for a 200,000km (125,000 mile) vehicle life. We don't know if this number has been plucked by assuming 800 recharge cycles at maximum range, or has been calculated from some more realistic usage pattern. If the latter, it means the batteries are more durable than many rivals. The two companies also quote acceleration of nought to 50km/h (31mph) in 4.9 seconds and a top speed of 130km/h (just over 80mph). The precision of those figures (4.9 seconds rather than a round five seconds) suggest that development is already at an advanced stage. Indeed, the BlueCar prototypes “passed approval tests on August 7 2007”, according to Bolleré, suggesting that Pininfarina may simply need to create a body and build the thing. And, of course, undertake the sort of shake-down programme that has been such a trauma for electric sportscar pioneer Tesla. Deposits are due to be taken in December 2008 and the first paying customers will take delivery before the autumn of 2009, Bolleré said. It added that the car “will be sold at €500 per month” (about £360/month), indicating that it might be leased instead of (or in addition to) being sold outright. Production plans will start with a modest 1,000 vehicles by mid-2009, limited by Bolleré’s battery manufacturing capacity. It envisages production rising to 4,000 units in 2010, 5,000 in 2011, up to 10,000 in 2012, and 15,000 in the following years. The electric car will be built by Pininfarina and sold under its badge. Or at least that’s the plan at the moment. We wouldn’t be surprised to see a bigger marque putting some money into the project and taking all the credit, if the product is as good as it sounds. Particularly given the potential financial benefits of having a zero-emission model on your books when selling cars in Europe.